Main Photo: Ibitirati big wall, 700m. Like I said before, in Brazil we’re not only samba, pretty women, carnival, beach, violence and football. We are also climbers and we do have places to climb. Better, we have a lot of climbing, it is difficult even to count how many. Probably adding all the routes in all Brazilian states (if it is possible to do this), I believe we would reach a total of 5000 rock climbing routes, and maybe more. This number is a wild crazy drunk guess. Not enough? This number continues to grow every single week. It turns out that recently it came out a new big wall route, impressive trad climbing with 1.260 meters (4.134 ft) on a mountain called Pedra Riscada in Minas Gerais state, making it the biggest brazilian big wall. 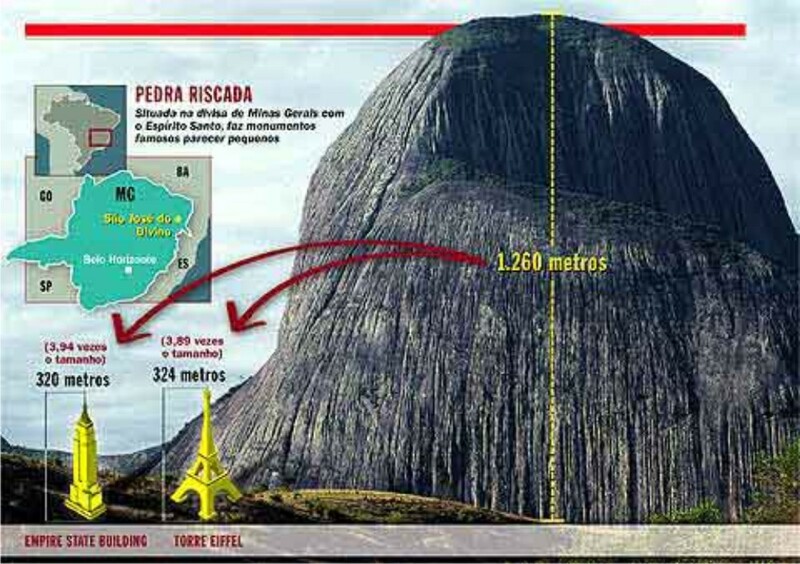 Update - June 28th, 2013: Another huge route was conquered in Pedra Riscada again, called "Divina Liberdade", 1100 meters (3.609 ft), great ah? It all started with smaller routes decades ago. As the years gone by, the routes eventually got bigger. The rock climbing was also reflected in our mountains. In the early 1990s were open three routes in Rio de Janeiro with difficulties that have previously only been found in blocks and cliffs. One was the “Barriga do Pássaro” (“belly of the Bird”), classified as a IXb (BR) (5.13b US), a variant between “Caixinha de surpresas” (“box of surprises”) and “Waldo” routes, in the north side of Sugar Loaf. This route was opened by Ralph Cortes, Luis Claudio "Pita" and Márcio Lozada, being completed for the first time after a few years. After that, Alexandre Portela, Luis Cortes Claudio Pita and Ralph opened the “A um passo do espaço” (“one step to the outer space”), VIIIc (BR) – 5.12c (US), on the Totem of Sugarloaf. From base to the summit, going through the routes “As Lacas também amam” (“The cracks can love too”) and “Revolta dos Gravatás” (“Gravatás revolt”), there are at least 5 pitches, totaling 240 meters, mostly graduated in VIIc (BR) – 5.11c (US) and VIIIc (BR) – 5.12c (US) in the last edge. 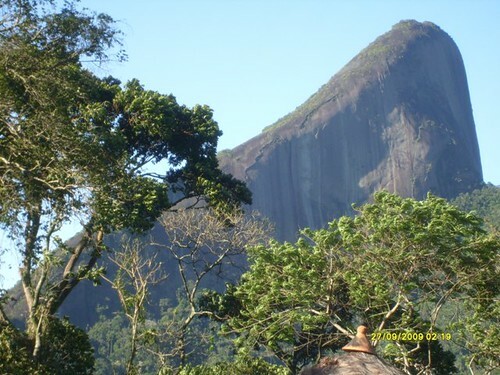 In Corcovado, Alexandre Portela, Luis Claudio "Pita", Sérgio Tartari and Marco Vidomi opened the “Atalho do Diabo” (“Devil's shortcut”), working every thrust out all the way up until a section of free climbing. There are about 300 meters, with one pitch of VIIIa (BR) – 5.12a (US), two pitches are VIIIc (BR) – 5.12c (US), one of Xa (BR) – 5.13a (US) and others in seventh grade. The route still waits to be completed in just one push from base to summit in one single day. "Pita" came close to it, climbing it with only one fall. The Xa pitch was not completed without falls so far. Even today this route is a challenge for new generations. Photo: Época Magazine, n° 233. The "E" which constantly appears in our description of the route means the degree of exposure on the route. The higher the number next to the "E", the route is more exposed. The "A" which also appears in some descriptions means that some parts of the climbing require artificial rock climbing and of course use of proper gear to do so. 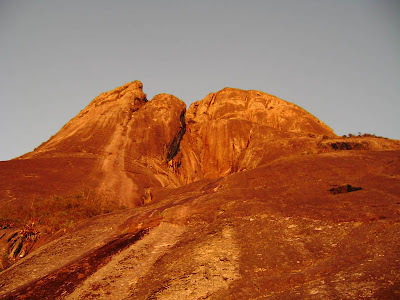 The intent of this extremely short article is of expose the biggest routes of rock climbing in Brazil. I have not done a complete description of the routes because obviously being a high altitude mountaineer, non-practicing rock climbing itself, I do not get involved and do not know very much about it. However, I think I could give you an idea of the quality of our walls. These are just some examples. We have many more routes of 750 meters, 700 meters, 650 meters...on and on. Remember this: I am not a rock climber (at least yet), so I don’t have the knowledge to describe precisely the routes, number of pitches, bolts, protections and all this things. Be advised, rock climbing in Brazil always involves close encounters with angry bees, sometimes poisonous snakes, poisonous spiders, risk of bad weather and very often, lightnings. >"Guia de escaladas da região dos 3 Picos”. By Sergio Tartari. >"Escale melhor e com mais segurança”. By Cintia and Flavio Daflon. 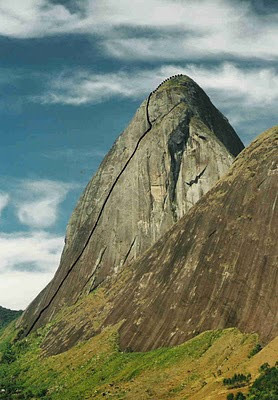 Even so, if I were you I’d schedule a trad climbing in Brazil. Why not? Life’s too short. Many thanks to SPer Marcsoltan by some clarifications he gave me about some doubts i had. one of the best reasons to to stick around summitpost! Thank you for submitting. a GREAT page. cheers Paulo. You have the book already ahahahahah!!! Thanks Gabr for reading it. 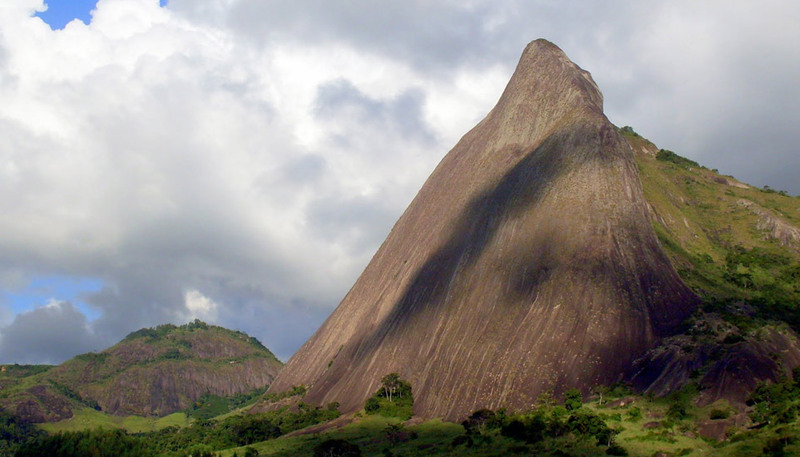 just as the previous article, the one about the history of Brazilian mountaineering! Specially interesting as Brasil really is a country which isn't often associated with any form of mountaineering or climbing, and certainly not this kind of big wall climbing. Some impressive rock faces you have over there! That is my point. People often think about us as everything else but climbers. And there is much more i could show here...for instance, every state has its own mountaineering/ climbing club, some states have dozens of clubs with hundreds of members. Every state has its own federation too...Man, we're big! Well i found two different names for that route: "Soma de todos os medos" (Som of all fears) and "Sombra de todos os medos" (Shadow of all fears). I used the second one since the image of the route says that. I'll look again as soon as i can. Good climb up there! I'll hit Caparaó National Park. This is a great page!! What r u waiting for? Book your flight right now to Brazil! Este article is Gostoso Paulo. Congratulations broooo!